The colors will be the same between the mini and the full size bag, the mini is obviously just smaller. The scents are the same as well, but there are product differences on what is included, or the sizes will be different! Of course, February was pretty pinks! L-R is Glow Cloud, Tsukimi, and Crimson Nebula. 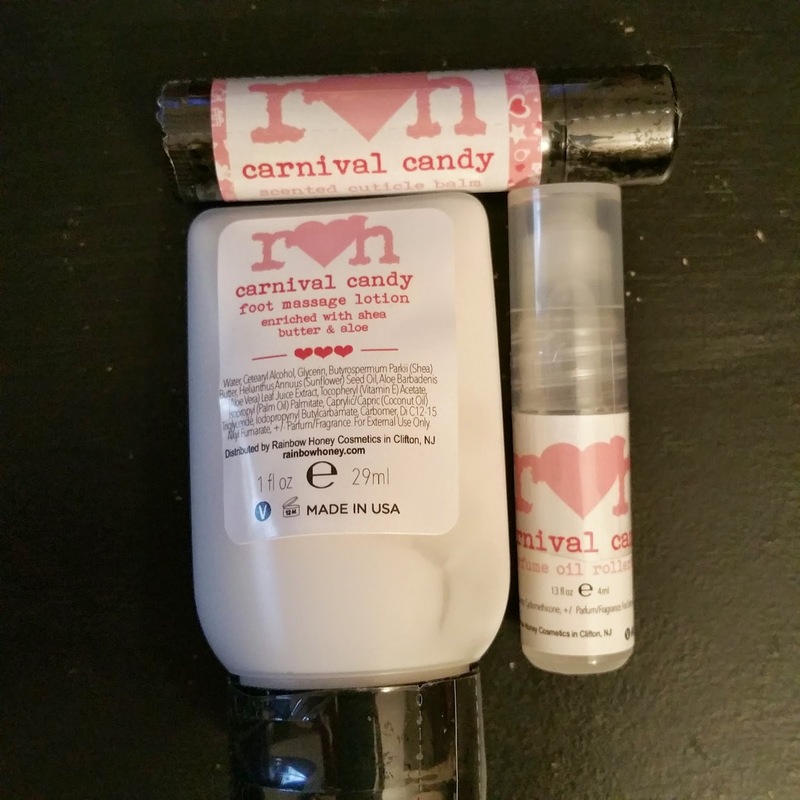 The scent of the month was Carnival Candy, which is seriously the bomb. It's sweet, but not so much that you want to puke. In the mini, the products included were a cuticle balm, foot massage lotion, and perfume oil rollerbalm. I love how there are different products each month along with the three nail polishes/products. It gives me some different scented things and opens me up to the new stuff that Rainbow Honey is putting out. RH is a great brand and they are great with keeping things in stock. They close shop monthly to check stock and add their new collections in, so following them on their Facebook page is a great way to keep up to date with when they will reopen! For what little I paid for this, it's definitely worth the money! Even if I don't always like the polish colors, the products are almost always worth it alone. 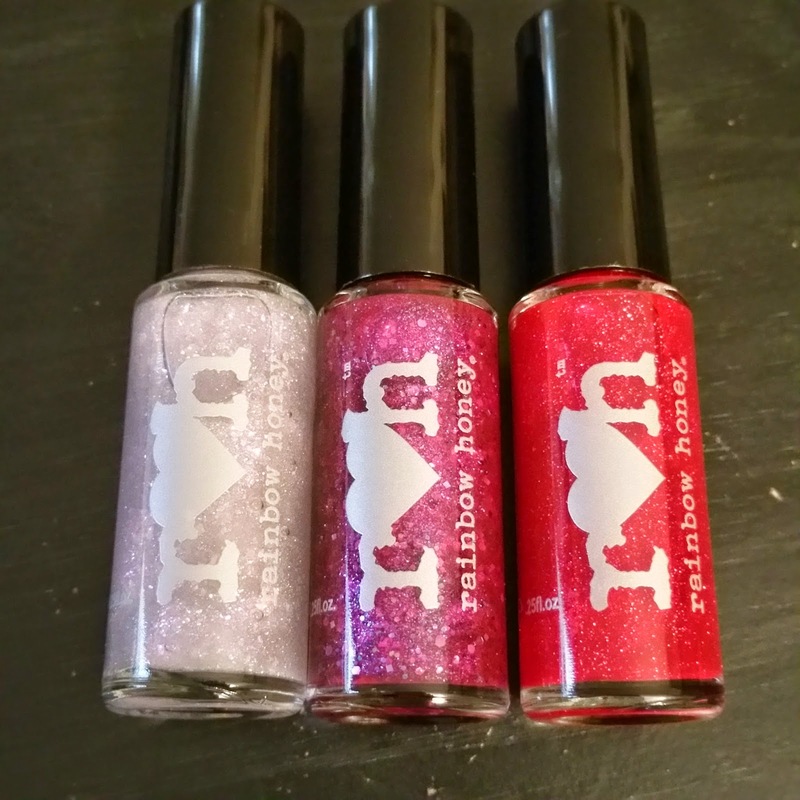 If you got Rainbow Honey's February Mystery bag, let me know what you thought of it! If you got the full size bag, feel free to leave in the comments if there were differences other than sizes!